The FaderPort 16's unique Session Navigator provides easy access to eight mission-critical functions for maximum flexibility. Use the large encoder button and companion buttons to edit and mix with greater efficiency and speed. Scroll through your timeline, using the encoder, or work measure by measure with the arrow buttons; zoom in and out on the timeline with the encoder and make your tracks larger or smaller with the arrow buttons; navigate and drop markers; and maintain constant control of your main level. Once you start using the Session Navigator, you’ll wonder how you mixed without it. *Features may vary depending on your software. FaderPort 16’s streamlined workflow and support for the Mackie Control and HUI protocols make it fast and easy to control virtually any DAW. No driver installation is necessary; just plug the control surface into a USB port and take command of your mix and plug-ins. 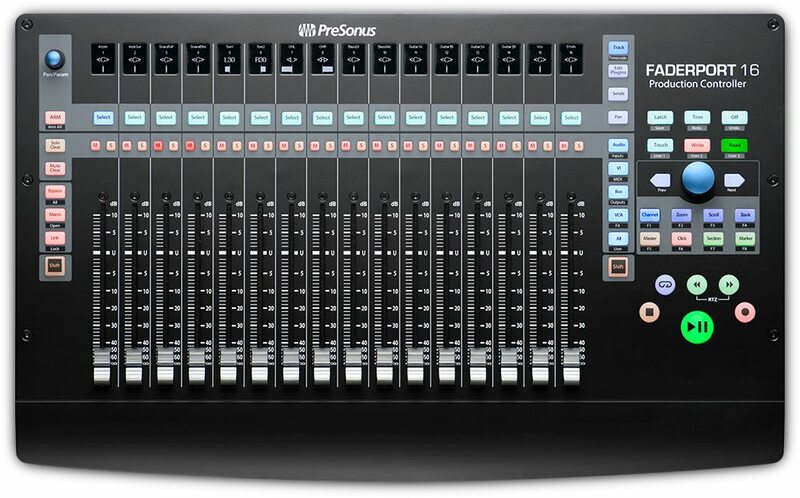 But the FaderPort 16 is downright magical when used with Presonus studio one. (Studio One Artist is included.) You’ll be amazed how much faster you can work. With the compact, easy-to-use FaderPort 16, you’ll enjoy the fastest, most efficient workflow and the most session control you’ve ever experienced. But don’t just take our word for it; visit Parkway Music and try the FaderPort 16 for yourself!